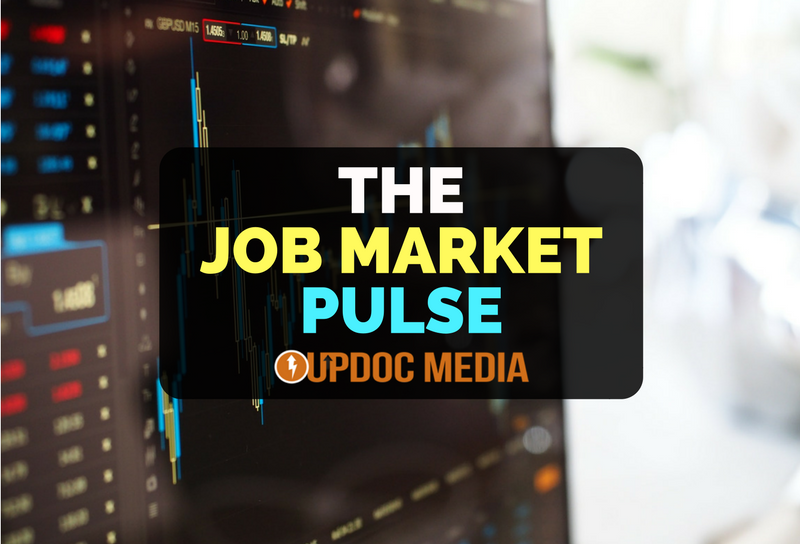 In Summer of 2015, UpDoc Media began its journey creating “content you need to know, delivered with clinical precision.” For blogs, the most popular topic at the time was: The Job Market. 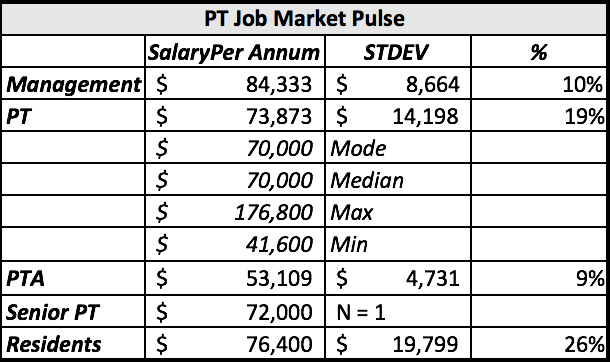 Since then, we delivered the PT Job Market Outlook 2.0, which turned into the PT Job Market Pulse. Soon, there were requests across the continuum of the allied rehab therapy community to incorporate data to encompass travelers, as well as occupational therapy and speech language pathology. And, so… it was done! For Thanksgiving 2017, we are pleased to unveil the 1st release of the Job Market Pulse 2.0 — Winter 2017 UpDate! As always, the most popular element is the downloadable spreadsheet of raw data, accessible in the final link of this blog post. This latest Pulse will include insights from the Year One report as well as the new data, since. Here’s the short version. Year One vs. Fall/Winter of 2017. Where Are We? It appears that in the last quarter, we’ve seen a small increase in the market. How much of an increase? Somewhere between 2-3%. Nothing earth shattering, but noteworthy. However, there appeared to be some variability since the year one report, which was release this summer where there was a market drop of just under 2%. So, is a 4-5% window of variability normal? We shall soon see! What’s New With The 2.0? 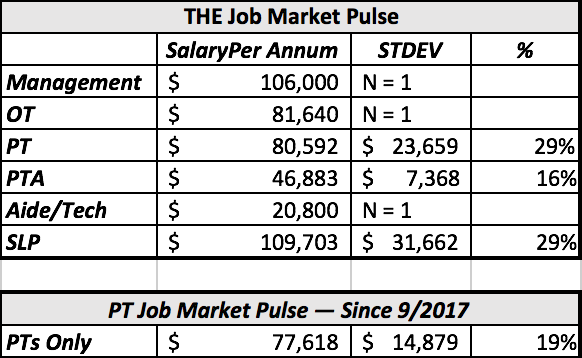 Behind the curtain, THE Job Market Pulse 2.0 data set is actually separated from the legacy material of the PT Job Market Pulse… even that of the year one report. That said, there’s some interesting initial impression that are worthy to be shared. PTA pay is less variable than PT pay. Still, the standard deviations are double digits. SLPs are getting paid, quite well. Anecdotally, this is an issue of supply/demand. Obviously, we’d love to have more data from OT and SLP. Since this movement of combining industry data sets is relatively new, we can reasonably expect better representation heading into the New Year. General PT pay still resides with just shy of 20% standard deviation. Which means, 68% of the job market pay is reasonably within the window of $63k – $92k per annum. It’s important to remember that Pulse data ONLY captures cash payouts. It’s in the works to provide an updated calculator in terms of what burden is required of employers in terms of benefits, overhead, tax/tip jar, etc. I’d be seriously pissed as a manager here vs. the manager “upstairs” in the 2.0 data set. I’d be even more pissed as the “Senior PT” making below average pay — given, that pay is highly regional in terms of variability and this individual may very well be in a place where the economic burden is relatively lower — all that said, I’d still be pissed. PTAs need to recognize their value. There were more contributions of in 2.0 from travelers, who typically make far more than stable full-timers. That said, it seems that many travelers are being paid far below market averages. We have some academic and research job data… still, not enough. So! If you know anyone in that space, please welcome them to this movement of wage transparency & wage literacy! Perhaps one of the coolest aspects of the Job Market Pulse 2.0 is the negotiations data column. This, I was personally excited about as negotiations is something of a passion point for me. Here’s what we have, in black and white. Firstly, it should be more than apparent that asking for a dollar more an hour is MORE than reasonable. In fact, most should consider asking 5-10% off the cuff. Plenty of people are low-balling themselves with 1% asks. Some are successfully going for double digits. PLENTY of individuals (as you can explore in the raw data, receivable via sign up below) are simply turning down offers if they aren’t good enough… something employers are becoming increasingly aware of. So, What Are Some Take Aways? Coming from PPS 2017, and, with discussions representing companies of all sizes — finding and retaining talent is still a huge struggle. Ultimately, it’s not even finding and attracting the talent that is the problem. It’s all about talent retention. And, surprise surprise — it’s not the pay that keeps them there. It’s the culture. In general, we need to negotiate UP… and, do it with respectful confidence. This reflects on us not just as practitioners… this is a mindset war; a question of cultural stance and unwavering values. If we are willing to do this at the individual level, then we WILL do this at the corporate level — an important consideration when we play the inevitable tugs of wars with 3rd party payers & prove our value to the market at large. Once again, “experience” doesn’t pay as much as we think it does. LOYALTY pays… loyalty in the form of regular raises, better PTO banks, and higher levels of employer contribution to retirement plans — good or bad, this is remains a norm as well as sizable economic burden to legacy corporations where developing professional burnout is rampant and incumbent engagement remains yet to be seen. That’s it for now. If you’re interested in reading up on the Year One Report and/or downloading both data sets — this and last, please click on the link immediately below to join the Pulse!